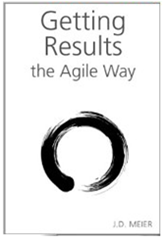 Agile Results allow you to make adjustments, immediately or over time, as you need them. It’s more than just a systematic way of doing things. JD provides insight, advice, through proven practices that he and others use. It is more than just a Project, or a Value, or a Habit. It’s a combination of them all, and they all work together synergistically. So, pick any given project or goal you might have. Just try starting with something simple from this large swath of information from JD (another thing I learned – keep it simple). Say like, the rule of 3, the reflection pattern and then after a few weeks of trying it out, look at the results. It’s amazing. I did it. And you’ll want more. I was completely overwhelmed, overworked, and behind in a huge project delivery. I needed a way to get it done, effectively. JD gave me a hint to read through “Getting Started.” Of course, the last thing you want is more workload, but I listened and tried applying it immediately. I haven’t stopped. Every day, every week, even monthly, quarterly, yearly, the rule of 3 is my foundation. And now that’s just the beginning … imagine what’s next.